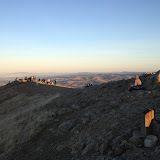 It is colder and breezy on Mission Peaks this Saturday. Got up a bit late and headed there about thirty minutes later than what I originally planned. Probably that worked out better. Without decent amount of sunlight hitting on the face, it would have been uncomfortable on the peak with all the wind chill there. The sky was neither super clear nor cloudy, hence the day offered no good views from the cliff. Shot a few pics anyway. We had special T-shirts ordered for the occasion and they came up pretty well. 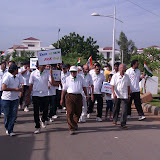 I was present only for the walk on the day, but that itself is a great experience. 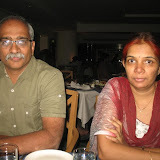 We headed out to BlueFox for dinner on Latha’s Birthday. This year, Srihari is here on a trip to India on the birthday. Right after the birthday, we did the usual ritual of cake from JustBake. Here are the pics from the day. Our apartment complex waited till the last day, Sunday the 11th, for nimajjanam. The day’s activities started with pinata equivalent, in which kids and adults participated alike. After that, the auction for the Laddu has started. We participated in the auction and lucky enough to win the auction. 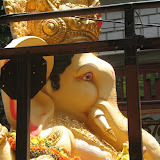 Once the auction is done, the idol is mounted on the truck and the procession started. As usual, we have traditional music of drums, dances and fireworks during this first leg of the procession – it takes about 40 minutes to pass the 200 meter long road within the apartment complex. You can see the day in pics here. Once the idol is seen off till the main road (the second leg of the procession is faster from here – the truck covered the next 5km in about 15 minutes till the lake), we started the community lunch in the apartment complex. Served one of the dishes at the buffet lunch that is attended by about 500 people. Kids completed their lunch early and played games like dumb-charades. I am on cloud nine on Fathers Day. Spurthi made a bread-omelette for me today. With kids’ smiling faces around, the day is as bright as it could be. Back from my 5 day pongal trip to West Godavari district. Two days are spent in driving to and from my native village and I spent rest of the time within a 25km diameter while visiting several of my relatives and friends. I drove my Xylo for the trip and it clocked 1175km for the entire trip. Headed out on Wednesday for a 525km drive and visited a few relatives en-route. Return drive is a bit shorter and involved no visits. Chakri’s music churned out a good audio album this time for VV Vinayak. Chandrabose penned lyrics. Dil Maange More: This is a good dance number by Kunal Ganjawala and Mahalaxmi. Talks a lot about the hero and his relationship with Bezawada (Vijayawada), which is the backdrop of the film. Tu Mera Jil Jil: The lyrics have lots of Hindi words. This is the best and most hummable number of the album. Udit Narayan and Sadhana Sargam did a very good job. At times though, Sadhana’s voice fails to render some fast words (naa badi nuvve, naa gudi nuvve, naa odi nuvvega) in a native way. Overall, this is the song that lifts the album to class level. Muripinche Maina: The song starts with the tune of Thannana Thannana from Guru, but after a few seconds, the true colors of the song are revealed in the voices of Farid and Kousalya. This fast number would for sure impress youth and mass audience. Taratta Ettukupotha: Kunche Raghu is back! His voice fits very well for Raviteja and I love this singer. You may term this song as the title song. The tune goes through several variations and has potential to exploit the director and hero of the movie during filming of the song. Nee Soku Mada: Music director Chakri himself gave voice to this number. This song is a breed of a classic tune with current day lyrics (?) and some rap. It has all the words one would use in a verbal street side fight, in the disguise of teasing the lead actress. This song may be funny enough in the movie, but may not be the right one to hear repeatedly. Why would I spoil the mood of listening to a classic tune with the out of sync lyrics? Adaragottu: This tune is a typical Tamil vamp song (I think I heard this tune in one of the Tamil music channels while flipping channels.) May work well in B and C grade centers. The voices of Vasu and Sivani gave the results expected for such numbers. Overall, this album takes the movie audio much farther than VV Vinayak’s previous flick. With the cast led by Ravi Teja, this album matches the expectations of audience. A good album to have in your commercial movie collection. This blog entry is being typed on board Singapore Airlines flight SQ16 from Singapore to San Francisco using Sun’s StarOffice that is part of the in-flight software suite. Once I boarded this Boeing 777, I am amazed. The seats are spacious, leg room is great and the personal LCD screen is big (12 inches). In addition to that, I spotted these video-in, USB and ethernet ports. Out of curiosity, i switched to the computing view and there it is, the familiar (on the desktop) view of StarOffice suite. I knew that Singapore airlines started using StarOffice, but never realized that they got it to such a commodity level. It is great to see an office suite as part of the on-board computing infrastructure. Text entry is with the mini keyboard on the back of the remote and all files are stored on the USB stick. Typing the text is not so easy but the mouse response is great. The monitor quality is same as my laptop. It is a great experience to be able to type blog entries on board the flight. So what we are seeing here is an office suite appliance, that is sufficient to do lot of tasks for a traveller. The ideas can be documented there itself, the expenses can be documented in a spread sheet as opposed to on a paper. All this, even without opening the laptop and worrying about battery life. Good job Singapore Airlines! I love this. On Saturday, we conducted the meeting of Hyderabad Open Solaris User Group (site, forum.) This group is still in infancy stages and I am assisting the group to come up to speed. The venue is Kamma Sangham building at Ameerpet. We started the meeting by 3.00pm. It was raining a bit on the day, hence the attendance is relatively low. NIIT sponsored the event and provided the logistics support. The attendance is 100+ and mostly consisted of student community. We talked about the Open Solaris in general, and the way to join the Hyderabad Open Solaris User Group. I gave an overview of OpenSolaris and demonstrated few tools on OpenSolaris. There is a special offer to attendees of this meeting. They can opt to receive a free Belenix CD or Solaris Express developer CD. For more details, refer to HOSUG page.